There was a time when Ireland was the leader in offshore wind energy. Just over 15 years ago, the world’s largest offshore wind farm was to be found in the Irish Sea. Turbine manufacturer GE Energy and renewable energy developer Airtricity co-developed a seven-turbine offshore wind farm off the Wicklow coastline. Generating 25MW of green energy, Arklow Bank Phase 1 was designed to prove the capability of offshore wind, not only in Irish waters but globally. 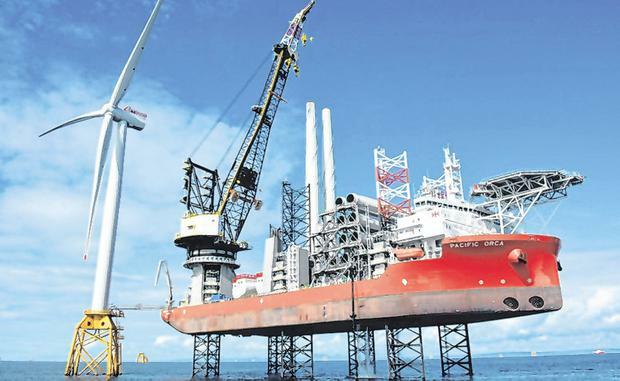 Opened by then-Taoiseach Bertie Ahern, there were broad political hints that funding support for offshore wind energy would be forthcoming for future projects around our island. Well, that was then – and the policy promises of over a decade ago never materialised. As we enter 2019, the seven Arklow turbines remain the first and only operational offshore wind farm in Ireland. Where Ireland was a leader in renewable energy 15 years ago, we are now internationally recognised as the worst performing European state on climate action. Our carbon-emitting sins are many – and we’re one of the few EU countries where carbon emissions continue to climb. Onshore wind energy has been a huge success here in Ireland. But the scale and urgency of the challenge is now greater than ever. We can no longer solely depend on onshore energy to meet our climate and energy targets. We need to look beyond our 2020 targets – which we will miss – to targets for 2030 and out to 2050. We need a new renewables revolution, and that revolution needs to be offshore where oceans of opportunity lie. Ireland’s potential for offshore wind is enormous. Our seabed territory is one of the largest in Europe, more than 10 times the size of our land mass. We have an incredible wind resource off our entire coastline. We already have a number of significant projects in Irish waters, at different stages of development, which can deliver around 4.5GW of offshore energy in the coming years. At SSE, we’re actively progressing our plans to develop the next phase of Arklow Bank Wind Park, which can deliver a minimum of 520MW of capacity. That’s enough energy from one offshore wind site to power around half-a-million homes or five new 50MW data centres. The industry is poised to invest billions of euro in large capital expenditure to develop offshore wind energy assets. However, policy and technical barriers continue to hold back the development of our largest renewable resource. For this reason, industry continues to encourage Government to implement a category of sufficient scale for offshore wind in the final RESS design. Additionally, we need action on grid. We continue to exist in a limbo where no grid connection policy is in place that provides access to the market for offshore. These policy and technical barriers can be overcome if the political will is there. So, it was important to see the Government publish its first-draft National Energy and Climate Plan just before Christmas. More heartening still was to hear the comments of our new Climate Action Minister Richard Bruton, who said Ireland will back a diversified energy system that is likely to include offshore wind in addition to other technologies. If we want an example of what a step-change looks like, look no farther than our nearest neighbour. In the 15 years in which Ireland’s offshore sector has been stalled, the UK set ambitious policies that delivered 7GW of installed capacity. Today, the UK is the global leader in offshore wind and almost 10pc of Britain’s power needs come from offshore wind. We need to take inspiration, and devise similar strategies for Ireland to ensure offshore wind is harnessed to power Ireland’s homes, businesses and economy. In doing so, we will ensure Ireland is a leader once again in tackling climate change, and playing our rightful role in promoting climate justice. Let’s make 2019 the year in which we make that change.